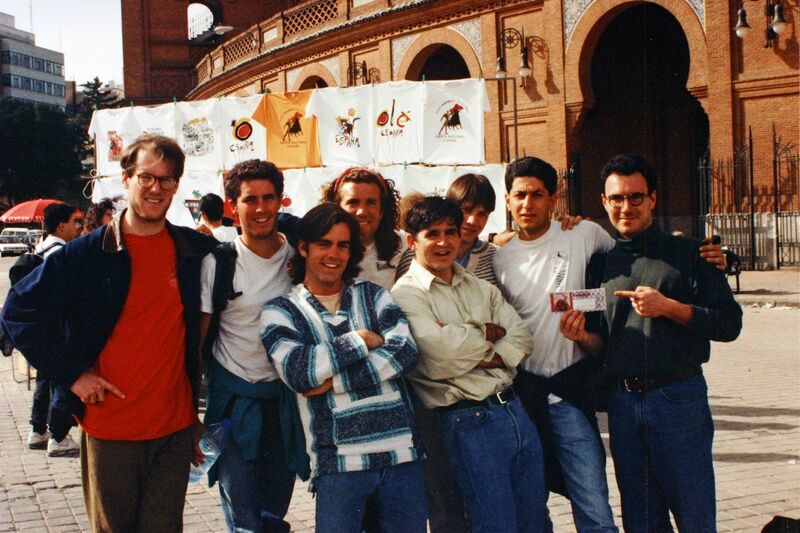 20 years ago I lived in Madrid for my junior year in college. It was a lovely time of life. I was very fortunate to make several new great friends while living in Spain, but i also brought with me several close friends from Palo Alto High School which coincidentally also ended up in Spain that same year (none attended UCLA with me, or had any coordination in planning their own year abroad to coincide with my choice of Spain/Madrid). At one point a motley crew of us ended up attending a bull-fight (under the auspices of one of our parents who was visiting and hosted both the bull outing and a epic memorable meal at Casa del Botin (one of the oldest restaurants in Spain / the world). 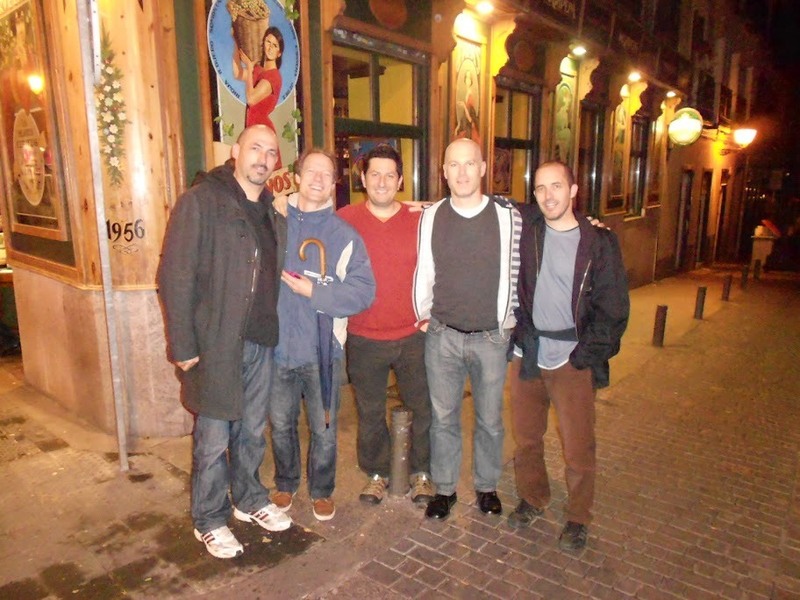 Clark, Tobin, Steve, Dan, Adam, Adam, me, and a local Madrid friend who’s name I can’t remember any longer! 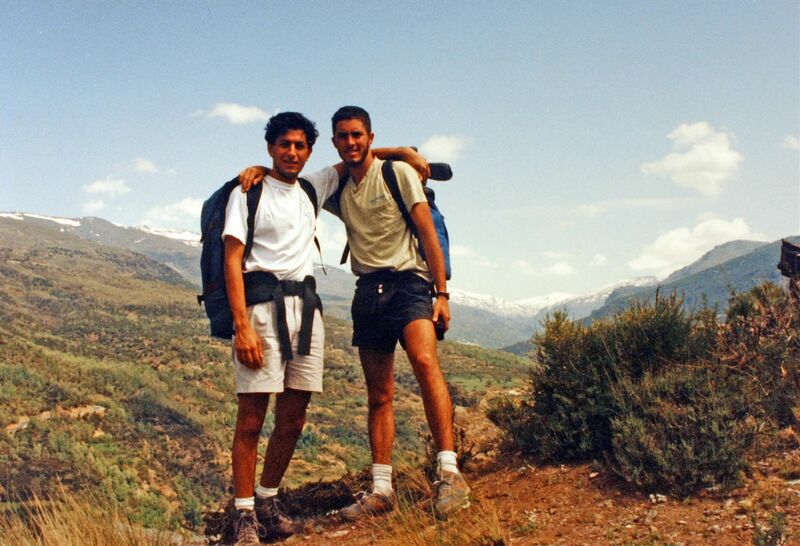 As my year in Madrid was winding down in the summer of 1992, Tobin and I went backpacking together in the southern Cordillera Nevada region which is in Andalusia near Granada. A magical string of small “white villages” dot the steep slopes of the mountain and are connected by small wandering foot-paths and a precarious mountain road with infrequent bus service. During a 3 day hike/camping excursion (and by “camping”, i mean we slept on the dirt ground by the side of the road) we had a bunch of laughs and celebrated Tobin’s 21st birthday. 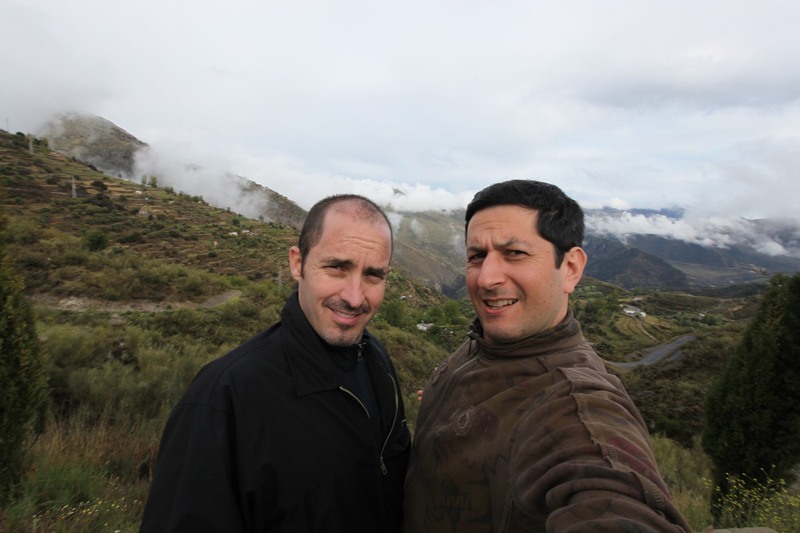 As the europeans made their ways back to their families, Tobin and I headed south to Andalusia and through bullet train and rental car transport (neither of which existed (train) or where available to us (as 20 year olds) last time we were here), found ourselves back in our old stomping ground in the Alpujarras. We couldn’t quite find the same brick wall to sit on and take our “20 years later” photo, but we were definitely in the hunt and amongst the same villages and fields. Everything seemed the same yet different–lots of internet cafes, more tourism, better roads… and of course, things just seemed smaller and less foreign in general (instead of quaint villagers, we were surrounded by german tourists). But hey, we did it–we made good on our “let’s do this in 20 years” pledge, and the 3 hour late lunch capped with yet another cafe-con-leche sealed the deal. As a bonus we hit Granada for some tapas and photo-taking, as well as Ronda which finally gave us some good weather and some ridiculously blue skies. We also had a chance to visit two of buuteeq’s customers in the region, the Hacienda de San Rafael (farmhouse turned luxury retreat, about 45 minutes from Seville) and Corral del Rey (boutique luxury in the center of the Santa Cruz old city center of Seville, walking distance from everything). 20 years old is a great age! Before the trip i often spoke of Spain and my time in Spain 20 years ago as equal parts of a wonderful recipe. Without taking anything away from Spain, i would now say with great clarity that being 20 is a great age and a great time of life and the fact that we were in Spain was a very big secondary dynamic. The “right of passage” concept played out elegantly for us 20 years ago, in europe and having access to so many inspirations (the art, food, architecture, and distinct culture of spain)–but really, the magic was inside us directly, and it hadn’t have been Spain our muse may have come in many forms. I am glad that I was “overseas” at that time, it was perfect for me and what I needed to really thrive and grow at that moment in my life… and I will recommend to my own kids when they reach the age. Looking -20/+20. Over a round of monster caipirinhas at the Beguim de Beguet (a favorite bar from 20 years ago, still operating, in dilapidated but charming disrepair) we did the group show and tell exercise of “where did you think you would be in 20 years, 20 years ago… and where do you think you’ll be 20 years from now” and for myself i feel very accomplished and connected on behalf of my 20 year old self–i’ve traveled broadly, experienced great happiness in my marriage and family, and accomplished more than i could have hoped for professionally (in terms of satisfaction), albeit not in the field that at the time I wanted to pursue (film industry). Looking forward 20 years, i had very little ambition in my answer–basically i just want to see the things that are already in motion play out (my kids, my marriage, healthy and happy, not as much travel, etc. )… and in this regard I really felt like i was looking into a mirror at my younger and older self, over a 40 year narrative arc, and giving a thumbs-up back at the mirror… i loved all three images I saw (20 year old, today, and 60 year old) versions of me. Travel is like getting into a teleportation machine. I’m so happy to be working in the travel industry (buuteeq, hotel marketing services company). Getting on a plane from Seattle and getting off in Madrid a day later was like rising into the sky and having the planet rotate beneath our boeing jet… when I got off in madrid I was surrounded by life-long-friends, transported back in time to 20 years ago where we retraced steps and experiences. Just a few days later to get back on the plane and just as quickly to find myself back in Seattle with my current day joys of family and work–it was a lovely trip.